"I’m excited to be on this journey to make sure young people’s opinions are taken into account." The 2018 Commonwealth Heads of Government Meeting in the UK promises to be a turning point for the 53 member nations of the Commonwealth. As the Commonwealth’s leaders meet to collectively resolve many of the pressing societal issues they face, so too is the Commonwealth Youth Forum which meets at the same time to provide young people from around the world a unique opportunity to make their views known on a global stage. Amongst the delegates attending the Youth Forum is 20-year-old University of Southampton student Thrinayani Ramakrishnan. 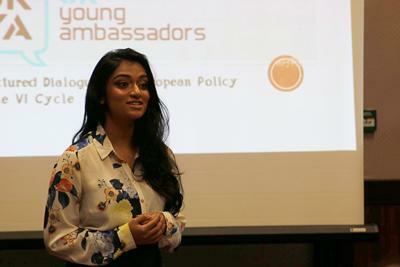 Born in India, and raised in Somerset, Thrinayani is a British Youth Council UK Ambassador to the Commonwealth who is attending the Youth Forum with a strong desire to make the views and voices of young people heard by decision-makers throughout the Commonwealth. “I was really fortunate to be elected by young people across the UK for this role,” enthused Thrinayani who is studying for a Bachelor’s degree in Mathematics with Actuarial Science. “I would love to use the strength and rich diversity of all UK youth to create a positive change within the Commonwealth – this was my campaign promise. “I feel UK young people deserve to have a greater chance to be heard within such a vibrant and diverse Commonwealth and country,” Thrinayani enthused. “I would love to make sure that the voices of UK youth are listened to and communicated to the Commonwealth whilst advocating for the protection, awareness and implementation of youth rights across all of the Commonwealth nations – from tackling racism to ending poverty and so using my experience standing up for young people. During the four-day Commonwealth Youth Forum, Thrinayani and her peers are holding discussions and seeking solutions to complex global challenges as they bring forward meaningful recommendations to the Heads of Government Meeting. “The Commonwealth Youth Forum is where young leaders from across the Commonwealth come together and create policy motions which will be put into a communiqué to be presented to the heads of government,” Thrinayani explained. “This is an opportunity for heads of government from across the Commonwealth to really take notice of the issues that UK youth and youth from across the Commonwealth are speaking up about and would like to see a positive change created by the governments of their countries. “The themes we’re discussing are prosperity, sustainability, fairness and security,” she continued. “Prosperity in terms of what is the future of work; we should be creating solutions for youth unemployment problems that exist not only in the UK but across the Commonwealth. “We should also be empowering and encouraging women in the field of enterprise and innovation against the backdrop of the portfolio of the Commonwealth where you have such a wide range of young people from all walks of life who can really contribute and help each other to try and solve solutions within their own communities. The second theme is sustainability - what are the blue and green economies coming up because they will differ in different countries,” said Thrinayani. “Another theme will be security – countering violent extremism and maintaining peace – which is crucial for all our communities. I really believe that one of the biggest challenges our young people face right now is not only trying to get that stable peace but maintaining that peace and making sure that resolutions are going to be found. And making sure that we get our point across to leaders to make sure that peace is maintained in our communities for young people’s lives. Throughout her young life, Thrinayani has developed a passion for human rights and a desire to make a positive change. An experienced campaigner, Thrinayani has previously served as a member of the UK Youth Parliament, speaking in the House of Commons on the importance of the living wage and joining a Youth Select Committee on the issue of votes for 16a having interviewed youth groups and MPs on the issue. She has also spoken within the House of Lords at an inter-generational debate on the UK’s status as a global leader. As a former Youth Advisor for UNICEF UK, Thrinayani interacted with senior officials, as a young person, contributing to the organisation’s strategies and campaigns as well as supporting the fund-raising activities. Throughout all of these experiences, Thrinayani has been focused on the belief that “this generation are the most engaged and wanting to contribute to make a positive change for our communities. “I really believe that the strength in our young people lies in our diversity,” she continued. “There isn’t one set identity for a UK young person and I feel young people are so much more aware and so much more engaged in trying to help make a change to help at least one person. Click here to view a short video of Thrinayani on Twitter.